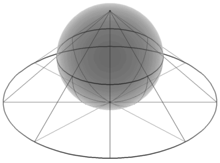 Perpendicularity easily extends to segments and rays. For example, a line segment is perpendicular to a line segment if, when each is extended in both directions to form an infinite line, these two resulting lines are perpendicular in the sense above. In symbols, means line segment AB is perpendicular to line segment CD. The word "foot" is frequently used in connection with perpendiculars. 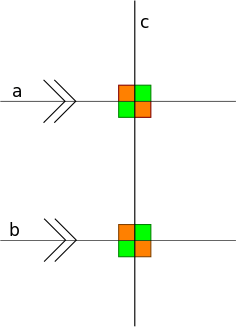 This usage is exemplified in the top diagram, above, and its caption. The diagram can be in any orientation. The foot is not necessarily at the bottom. Step 2 (green): construct circles centered at A' and B' having equal radius. Let Q and R be the points of intersection of these two circles. Step 3 (blue): connect Q and R to construct the desired perpendicular PQ. To make the perpendicular to the line g at or through the point P using Thales' theorem, see the animation at right. In the two-dimensional plane, right angles can be formed by two intersected lines which the product of their slopes equals −1. Thus defining two linear functions: y1 = a1x + b1 and y2 = a2x + b2, the graphs of the functions will be perpendicular and will make four right angles where the lines intersect if and only if a1a2 = −1. However, this method cannot be used if the slope is zero or undefined (the line is parallel to an axis). For another method, let the two linear functions: a1x + b1y + c1 = 0 and a2x + b2y + c2 = 0. The lines will be perpendicular if and only if a1a2 + b1b2 = 0. This method is simplified from the dot product (or, more generally, the inner product) of vectors. 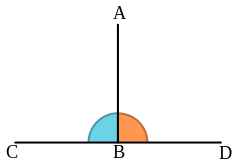 In particular, two vectors are considered orthogonal if their inner product is zero.